On a recent trip to Tokyo I ate yakitori to my heart’s content. Juicy thighs, crispy charred skin, toothsome cartilage, all skewered and grilled over slow-burning charcoal. 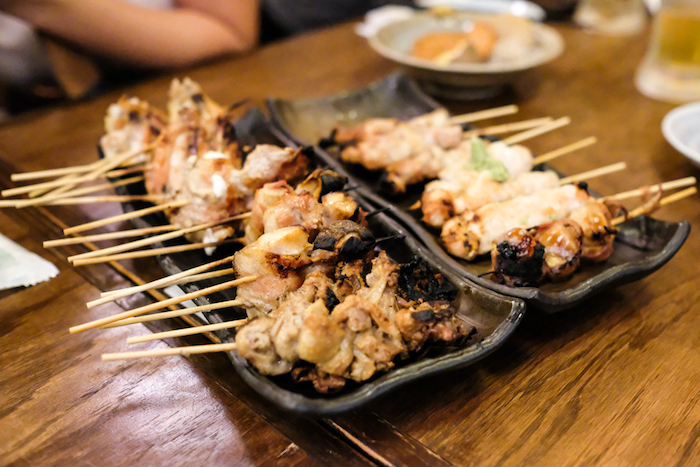 But yakitori is more than just chicken on a stick. Bouncy bacon-wrapped enoki mushrooms and mochi, slabs of beef tongue, luscious pork belly: If it can be skewered, it can be yaki-ed. Yakitori can be cheap or it can be pricey – it really depends on how much you can put away. Here’s a guide to where to find it around Honolulu. Carp Dori is an offshoot of a Hiroshima-based chain themed around the city’s Hiroshima Toyo Carps pro baseball team. Gone from its yatai stall at Shirokiya Japan Village Walk, Carp Dori is now a full fledged restaurant in McCully Shopping Center. Also gone are the skewers left under a heat lamp, making way for what I think are the best seasoned kushi in town. 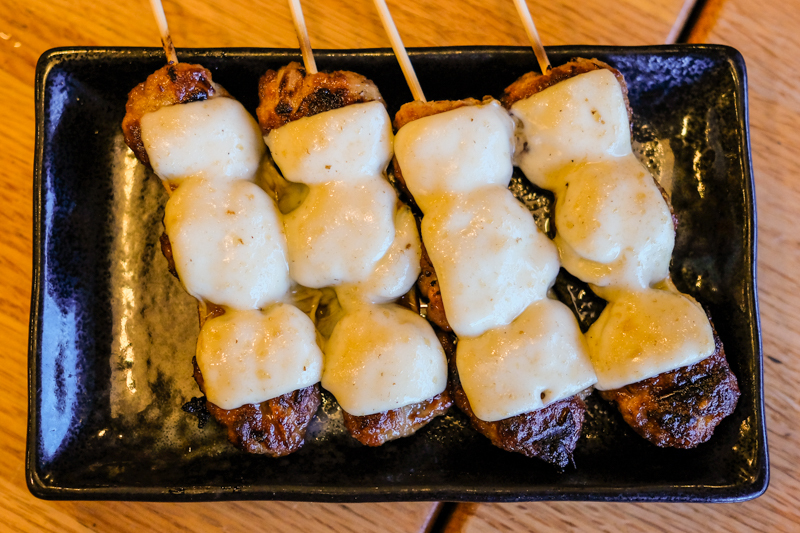 The tsukune cheese (minced chicken meatball topped with cheese) is an indulgent favorite as is the glistening butabara (pork belly). If the sticks don't fill you up, consider the motsunabe hot pot for a fantastic treatment to melt-in-your-mouth beef innards without the gamey taste. Their liquor list isn't that great but an imoshochu or nama biiru will do fine. Just don't forget to snag an order of the crispy fried chicken skin. Chris Quisote, Hawaii’s own salt bae, sets up Da Ala Cart tent around 9 p.m. in the Launderland parking lot on Beretania Street to grill kushiyaki for a motley crew of patrons. Da Ala Cart reminds me of the streetside yakitori vendors in yokocho (alleyways) throughout Tokyo. Chris posts his menu on Instagram (@daalacart) early in the day – offerings like the crowd favorite yaki onigiri ($3.50), beef ribeye ($5) and imitation crab wrapped in enoki mushrooms ($3.50). He varies his menu from time to time to include less common items like beef tongue and lamb. Hachibei opened in mid-January on the hottest block of Honolulu’s hottest dining hood, bringing the most luxe skewers the city has seen. The chicken theme runs deep in this chain from Fukuoka, so you’ll find bird parts not only on sticks ($2.80 each), but in an oyako donburi (chicken-and-egg rice bowl) and in a chicken-broth ramen as well. But Hachibei wants to bring “butabara (pork belly) to the world,” and this skewer indeed delivers. So does this beef sukiyaki stick, served with an egg to dip it in. One thing, though: Hachibei charges for green tea, $2.20 a cup, no refills. Aki used to roost on Makaloa Street, behind Keeaumoku Walmart, but has since changed ownership and now resides in an intimate open air nook below Himalayan Kitchen. 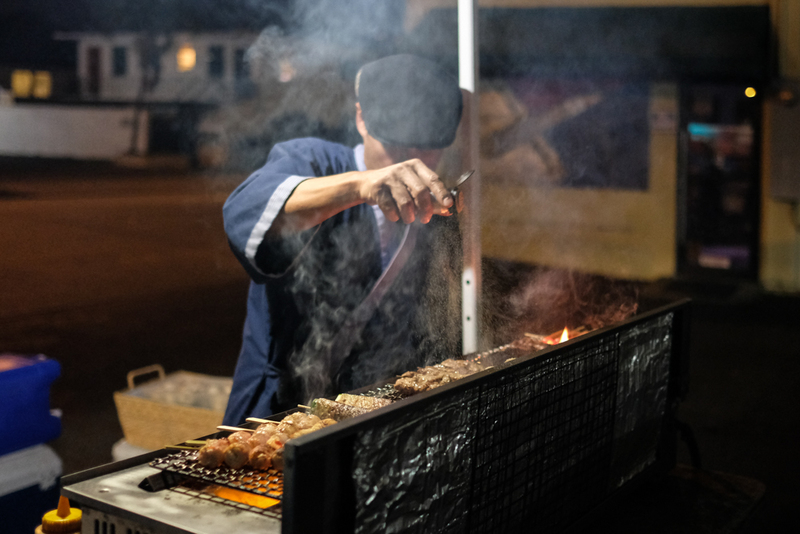 While it could be considered a full-fledged izakaya, Aki has always placed an emphasis on yakitori from it's Makaloa space, which used to be Yakitori Yoshi. Bar diners have a front row view of the young yakitori chef that dances from each end of the grill, turning and flipping skewers, but if you're going for the full experience, take a dip or two into the soymilk tantan and chili infused motsu nabe hot pots. 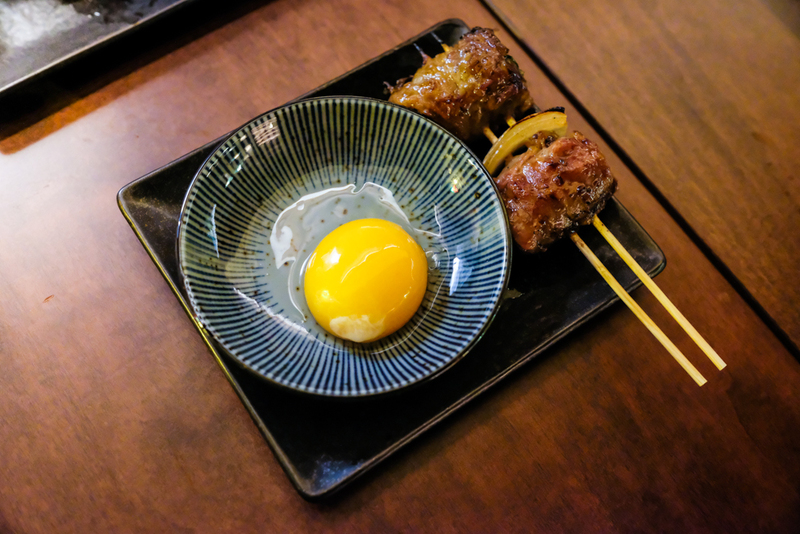 Toridokoro Matsumoto is not your average yakitori-ya. A branch of Fukuoka-based Yakitori Matsumoto, this 16-seat outpost is tucked away in a walk-up aparment on a side street near the bustling intersection of Kapiolani Blvd and Kalakaua Ave. Step inside and you're in Japan. From the bright, sterile lighting to the zen inducing rock garden framed by picture windows beyond the counter – you might have expected sushi master Jiro Ono to step out and begin forming nigiri. However, this once-referral-only restaurant doesn't have much in the way of seafood, it's actually an omakase-only yakitori experience and there's no substitutions. Squeamish about raw chicken sashimi? Don't bother booking a reservation because it too is on the menu. For its three-digit price tag, I would have expected more courses and skewers that were beyond what I could get elsewhere: where's the hatsumoto and the seseri? If you're into obsessive attention to detail and a high level of service, this is the yakitori experience for you. Torikyu took the place of Kohnotori on King Street near Imanas Tei in December 2016, but not much has changed save for Anchan and his crew which seem to have found new ventures. My favorite is the chicken skin ($1.95), which is expertly weaved onto a skewer accordion-style to maximize surface crisping. As the heat renders the thin layer of fat, it creates a crispy chicken skin chip. I also like the Japanese-style order slip – you just mark your preferences, hand your order to the chef and wait for your bounty. Check the board behind the grill for daily specials: You might be surprised at what’s available. Opened in Old Stadium Mall in January, Tori Ton is a wallet-friendly Japanese chain where nearly all the chicken skewers are $1.90 – and that includes thigh, breast, tail, gizzard and heart. But “ton” is also well represented (“tori” means chicken and “ton” is pork) with a ton of bacon-wrapped skewers. Try the bacon-wrapped ball of premium rice that’s basted in a sweet soy sauce, grilled and served with a raw egg yolk for dipping. It’s $3.50, but worth it. Tori Ton’s early days were marked by complaints about slow service; we hope that’s improved. Get the tsukune. 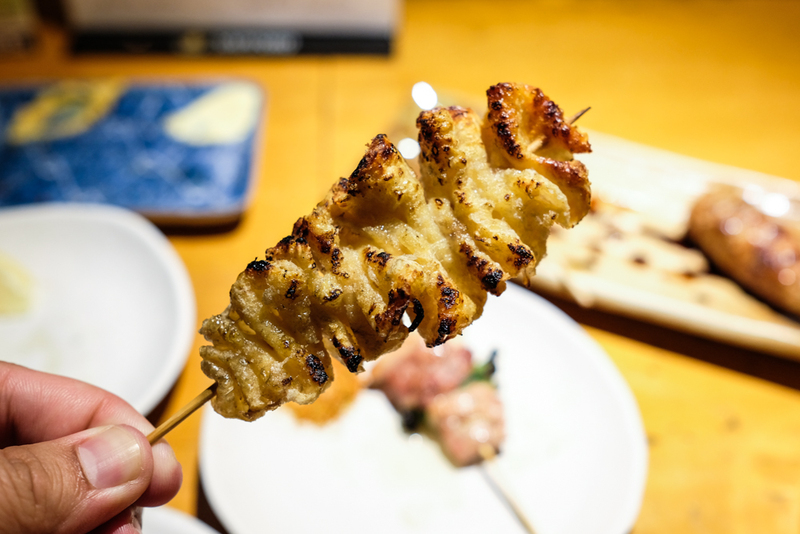 The signature item at this longtime University-area izakaya is the fluffiest minced chicken on a stick around – and if you prefer to go stick-less, it comes in a bubbling pool of cheese atop a live flame at your table. Be warned, though: There are about 20 varieties on the menu, all about $2 to $3.50 a stick. Plus you’ll find other kinds of yakitori, sushi, nabe hotpots and foods particular to the Nagoya region, like tenmusu (shrimp tempura musubi), miso tonkatsu and fried chicken wings. Takashi Ando, or Anchan as he's known to his regular customers, is the city's senior yakitori master, although he won't admit it. After grilling chicken skewers at other restaurants for the past 25 years, Ando now has a place of his own. In September, an intrepid Frolic reader tipped us off about a new yakitori bar opening in the old Country Shave Ice spot on Center Street behind Bank of Hawaii's Kaimuki branch. and low and behold: it's Anchan! He's keeping it simple for now with a BYOB policy and omakase-only (no menu) but I trust his skill that now I sort of prefer it this way – and if you're wondering, yes, it includes his signature motsu hotpot. I dream about this nabe and it might be even better than his kushi, but I'm not telling him! The humble yakitoriya whose mascot is a shaka-throwing, aloha-shirt-wearing rooster, is a staple in the local scene. Known as the value proposition shop, Glad serves kushi by the pair that are priced economically at $3.90. This makes it the perfect spot for couples or really hungry yakitori fans. Favorite sticks include tsukune cheese, negima, shio kawa and the fried menchikatsu bites. The shop was open for a number of years before closing in late 2016 because the original owner needed to return to Tokyo to begin preparations for the 2020 Olympics. By May 2017, Glad was back in the same space under new ownership who happened to be the chefs too. Yay.